One of the funny things about being a music journalist is the completely opposite ways the people in your life view your job. On the one hand, you have those friends and relatives who imagine that it must be really glamorous getting to rub shoulders with the stars (trust me, it isn’t – well, not always). On the flipside of that (actually, now that even CDs are becoming obsolete, does anyone use the word ‘flipside’ anymore? ), people within the trade will always warn you, “Never meet your heroes.” Don’t be too eager to meet that artist you’ve always admired, because chances are they might turn out to be a complete tool. I’ve heard more than a few stories from fellow music writers who stopped being fans of one artist or other the day they finally got to meet them in person. Well, last night I met one of my all-time favourite musicians… and I’m happy to say that things didn’t go quite so badly. I’ve been an admirer of the work of Nile Rodgers and the late Bernard Edwards for, um – let’s just say a very long time. Back when I lived in Freetown, I got hold of the 12” single of ‘I Want Your Love’ (on shocking pink vinyl!) at around the same time I came across a copy of their Grand Tour souvenir book. ‘Le Freak’, ‘Good Times’ and all their Sister Sledge tracks were already firm favourites, and over the years I pretty much gobbled up anything that had their stamp on it. I can remember vividly where I was when I heard of Bernard’s death (I was driving to Shepherd’s Bush to interview the author Courttia Newland for a literary mag when Danny Baker announced it on his show on GLR). More recently, I’ve been following Nile’s blog, Walking on Planet C (detailing his fight against cancer), which has been enlightening, having lost a couple of friends to the vile disease myself in the last few years. 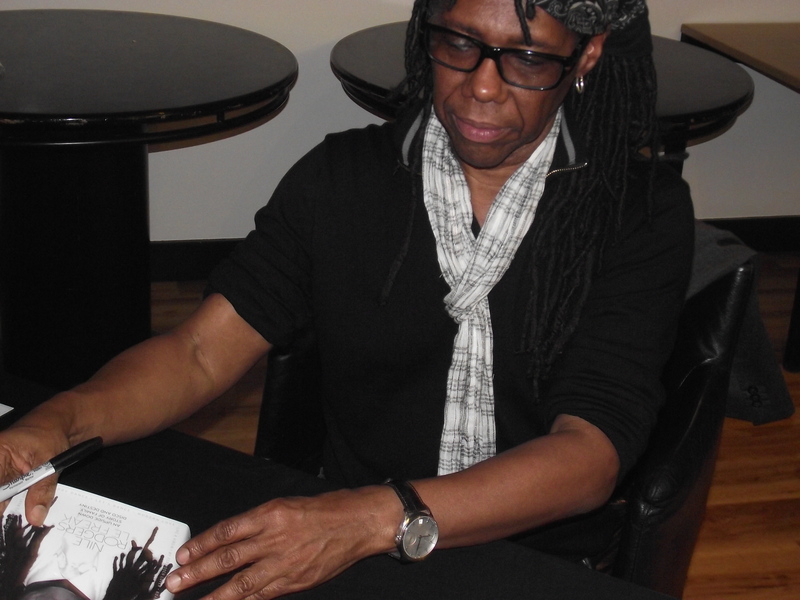 And yesterday, I was one of about 200 fans who gathered at Waterstone’s bookshop in Piccadilly, for an evening with Nile promoting his autobiography, Le Freak. I bought my copy a couple of weeks ago and have started reading it – though I won’t get a great deal of reading done this month, as I’m more preoccupied with writing a book of my own (yes, it’s that time of year again). The little I’ve read so far, however, I’ve found really captivating. I found Nile himself to be just as captivating during his interview. He is quite the storyteller; some of his stories I’d heard before (being a self-confessed Chic anorak), but quite a few I hadn’t – such as him being asked to be a judge on American Idol and turning it down (which is how Randy “yo dawg” Jackson ended up with the gig). When it was all over, we shook hands and said hello, he signed my book and my Chic box set, and I left Waterstone’s (in the words of the old Chic song) a Happy Man. Nile wasn’t the only hero of mine I encountered last night. The interviewer was Pete Paphides, whose writing I’ve enjoyed for many years – and who I was able to have a brief chat with as we stood in line waiting to have our books signed. When I started doing music columns for Surefish, I modelled my style on Pete’s articles in the little entertainment guide that comes with the Guardian on Saturdays (a writing style which has led to comments that I write “like a white person” – though I really don’t think I do, or even know what that means!). This article was awesome, George – you and your rock’n’roll lifestyle! 😉 I’m equally curious about being told that I write like a man….what does that even mean? I think meeting heroes can be an occupational hazard for most journos! I would say that most of the people I’ve met over the years have totally lived up to expectations, and there have only been a couple of times when I’ve thought ‘well I’m never listening to that so-and-so again’.